Life will break you. Nobody can protect you from that, and living alone won't either, for solitude will also break you with its yearning. You have to love. You have to feel. It is the reason you are here on earth. You are here to risk your heart. You are here to be swallowed up. And when it happens that you are broken, or betrayed, or left, or hurt, or death brushes near, let yourself sit by an apple tree and listen to the apples falling all around you in heaps, wasting their sweetness. Tell yourself you tasted as many as you could. -- Louise Erdich. Tonight, at All Souls Unitarian Universalist Church we will once again be hosting the Transgender Day of Remembrance Candlelight Vigil to honor those who were murdered in the past year due to transphobia. The list is long. Tonight 81 names will be read, with ages ranging from age 8 (Alex Medeiros, who was beaten to death by his father, on February 18, in Rio de Janeiro, Brazil, for refusing to cut his hair, liking women’s clothes, and dancing) to age 55 (Mary Joy Añonuevo who was stabbed 33 times in Lucena, Quezon, Philippines on October 21st, 2014. 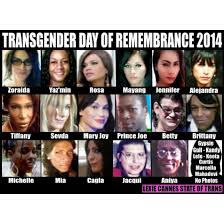 Of the names that will be read, 16 were killed in the United States; 10 of those were Trans women of color. Of the names that will be read, many will be listed only as unknown woman or man, lives lost tragically with no identity by which we can remember them. Of the names that will be read, virtually all of them were killed in extremely violent manners, showing the level of hatred and rage these killers had toward their victims. As the above case of Alex Medeiros illustrates, transphobia isn’t exclusively about transgender people, but about fear of those who are different, who color outside the norms of societal restrictions on gender performance. We will never know if little Alex would have grown up to be gay, transgender, or straight; his father took his son’s future away based on his own transphobia and fear of difference. For one thing, we can tell the truth. We can tell the truth to our children who ask us about bodies and genders. We can say there is a wonderful diversity of combinations of bodies and souls and sometimes they match what culture wants to see and sometimes they don’t, but we’re all uniquely wonderful and cherished; we are all of inherent worth and dignity, as we Unitarian Universalists like to say. We can insist on the overthrow of the pink aisles and the blue aisles that exists in toy stores, that continue the lie that there are "boy" toys and girl "toys." For that matter, we can begin campaigns against department stores who insist on "gendering" clothing. As if a few pieces of fabric stitched together is somehow meant for a boy or a girl just because of how it’s designed. We can speak to the managers of our local restaurants who have restrooms designated for "men" or "women" and ask that they consider making them gender neutral. I mean seriously, who of us has gender separate bathrooms in our homes? And yet, this is a fear Transfolk navigate in their daily lives: do I risk using the bathroom that fits me most and possibly get beaten up or worse, or do I try to hold it until I get home? We can check out the non-discrimination policies where we work and, if they don’t include transgender employees, advocate for that change. And, for that matter, why not talk to the boss about the bathrooms at work, too? We can come to events like tonight’s candle-light vigil and listen to the names being called, see the pictures of those no longer with us. We can feel the weight of their loss, the sorrow of their tragic deaths, and we can also remember the joy they held in their lives, the ways in which they lived authentically in a world that holds no space for them, and realize how, at the end of the day, they tasted the sweetness of as many apples as they could; we can be grateful for their lives, and their legacy, and we can carry forth their memories into our communities, so that the sweetness of their lives will not be forgotten. A quote from the Amazon show Transparent to honor this years Transgender Day of Remembrance. "Are you saying you're going to start dressing up like a lady?" "No. All of my life I have been dressing up like a man. This is me." Let's light candles and pray for a day when everyone can truly go through this life as they are.